Fittingly, the U of A Golden Bears hockey team ended its season by securing its 15th national championship on March 15. The Bears capped off an undefeated post-season run with a win against the University of New Brunswick Varsity Reds on Sunday evening in Halifax, securing their second consecutive CIS championship. 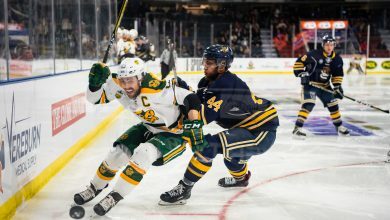 This added to the Bears’ CIS record for most men’s hockey national championships, and was the first back-to-back national championship win since the U of A themselves did it nearly a decade ago in 2005 and 2006. “A lot of great people have come through to set those standards, and we’re just trying to build on it and keep trying to find ways to make it better,” Herbers said. “The character in our dressing room, the commitment, the dedication, the leadership, it’s just outstanding in the Bears dressing room, and I’m glad the guys have been rewarded for all the hard work they’ve done since last year’s nationals. After being ranked as the top seed of the national championship tournament, and impressive 5-1 wins over both St. Francis Xavier and the Universite du Quebec a Trois-Rivieres, the Bears came into the final game of their season looking like the favourite to win. The Bears didn’t disappoint, scoring twice within the first 10 minutes of the game, and never relinquishing that lead en route to a 6-3 victory. The Bears’ special teams shined against UNB, successfully killing all seven of the U of A’s penalties and going 2-5 on the power play. The Bears looked impressive defensively as well, holding the Varsity Reds to just nine shots on Sunday night. Another major factor in the Bears’ success was their top players excelling at the most crucial point of the season during this tournament. Team captain and fourth-year forward Kruise Reddick was named tournament MVP after contributing four points in three games during the tournament. 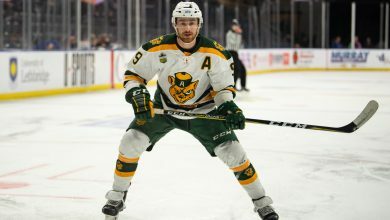 He was joined on the Tournament All-Star team by fourth-year forward Jordan Hickmott, who scored four goals and two assists, and fifth-year defenceman Jesse Craige. UNB looked to be a formidable opponent in the Bears’ efforts to bring home another national championship. The Varsity Reds have won a national championship every other year since 2007 — totalling four in that time period — before the U of A broke that streak this year. Besides the U of A’s win, the tournament saw the University of Guelph beat UQTR 3-2 in the close bronze medal matchup. Guelph reached that point after eliminating the Bears’ provincial rivals, the University of Calgary Dinos, by a score of 3-1 in the first game of the tournament. 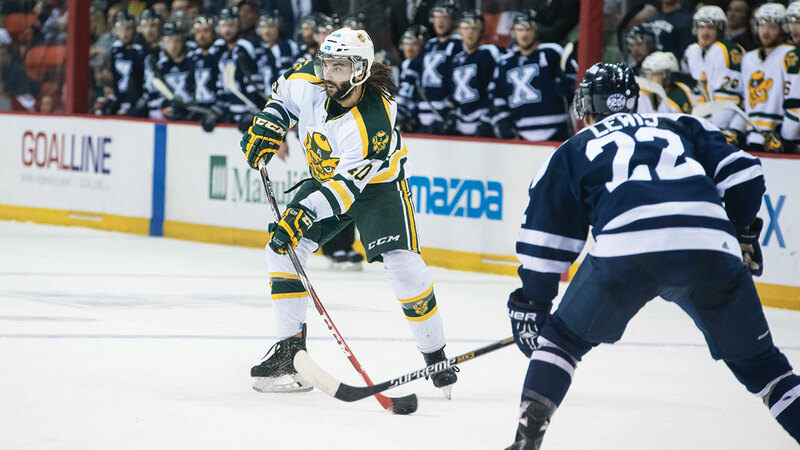 Looking ahead, the Bears will return next season with a slightly different lineup, losing the goalie that backstopped their win over UNB, Kurtis Mucha, and Craige, who was named the 2015 CIS defenceman of the year. The cycle leading to the Bears taking their shot at a third straight CIS title will begin for the team soon enough. “We plan to compete for a national title every year. That’s our focus and our goal. I guess we’ve set a tough standard for ourselves now, with 14 in ‘14 and 15 in ‘15. Now it’s about 16 in ‘16,” Herbers said.